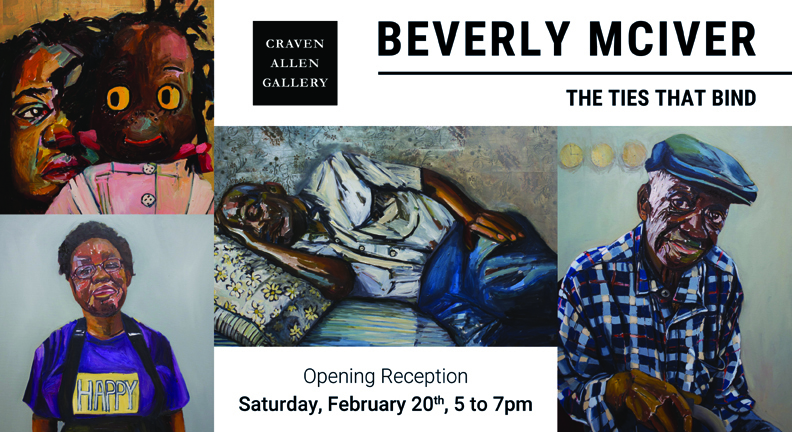 Durham- The exhibitions THE TIES THAT BIND: NEW PAINTINGS BY BEVERLY MCIVER and DUKE UNIVERSITY ADVANCED PAINTING STUDENTS: NEW WORK open at Craven Allen Gallery on Saturday, February 20th with a reception presenting the artists from 5 to 7 pm. Beverly McIver is a nationally recognized artist and the Ebenshade Professor of the Practice in Studio Arts at Duke University. Tori Bilas, Rachel Gallegos, Alexandra Gordon, Sylvia Herbold, Nicole Payne and Michaela Walker study painting with McIver. Ten percent of sales from the opening reception will benefit The Lucy Daniels Center, a non-profit whose mission is to help children lead emotionally healthy lives. McIver was the featured artist at the recent Expressions gala to benefit the center, and has a personal interest in the goals of the organization. Her challenges of balancing a career in painting with her legal guardianship of her mentally disabled sister Renee was the subject of the HBO documentary, Raising Renee. McIver’s latest work continues her exploration of family. Her subjects include her sister, friends, the artist herself, and most particularly McIver’s new relationship with her father. The Ties That Bind documents “ . . . the beginning of a love story,” in which she seeks to capture and discover her father, Cardrew Davis, through paint. The artist was shocked to learn the identity of her biological father at the age of 17, and it was only after her mother’s death in 2004 that she began to have a relationship with him. Mr. Davis is shown in many different contexts, but perhaps none more vulnerable than while sleeping, in a work called “Arrangement in Blue and Black No. 1” Many images reference the passage of time: clocks, calendars, letters, and childhood toys with McIver’s vibrant palette and luscious textures featured prominently. Showing alongside McIver are advanced painting students from Duke University: Tori Bilas, Rachel Gallegos, Alexandra Gordon, Sylvia Herbold, Nicole Payne and Michaela Walker. A passionate teacher and believer in arts education, McIver wanted to give these talented young women the opportunity to be seen in a broader context. The shows continue through April 9th. Craven Allen Gallery is located at 1106 ½ Broad Street in Durham. Gallery hours are from 10 a.m. to 6 p.m. Monday through Friday, and 10 a.m. to 4 p.m. on Saturday. For more information, please call the gallery at 286-4837 or visit www.CravenAllenGallery.com. One day when I was seventeen, my mother informed me that I had a different father than the man listed on my birth certificate. Her words were shocking to me, and I turned toward the screen door to find a large framed man standing at the doorway. My mother introduced him as my father. I could hardly breathe; I stood in silence and confusion. Cardrew smiled at me and extended his hand. I couldn’t move. My dad handed me a twenty dollar bill. I would learn over the next several years that the gift of a twenty dollar bill would be his way of showing love. My mother continued her anger toward my dad, never forgiving him for not rescuing her from a bad marriage. She often told me, “he will disappoint you, just as he disappointed me.” I didn’t want to believe her, but she was right–unlike my dad, my mom was present, and raised me and my two sisters. It was not until my mother’s death in 2004 that I decided to have a relationship with my father. I realized that it had not been realistic for my mom to expect my dad to rescue her. Cardrew is not capable of rescuing anyone. He’s a simple man, and lacks the ability to extend himself, or take risks. Perhaps his parents didn’t teach him to love fully, or how to express those kinds of feelings—except with a twenty dollar bill. After years of not knowing what a father’s love felt like, I now know. He’s a simple man that still values the gift of exchanging money. Mostly, I give to him and his response is “I love you for what you do”. His favorite foods are BBQ ribs, cream potatoes with gravy, cornbread and pinto beans, which I buy at a local soul food restaurant in Greensboro. In addition, I buy a bundle of antacids, NyQuil for sleeping and Gavascon for gas to make that southern comfort food digest properly. I believe that I have fallen in love with my dad. Even though he did not meet my mom’s expectations, I know why she found him attractive. I hope I have several years to continue to know him. I hope that this is just the beginning of a love story. McIver was born in Greensboro, North Carolina in 1962. She is the youngest of three girls born to Ethel McIver. Her oldest sister Renee is mentally disabled, with the mindset of a second grader. Beverly is Renee’s legal guardian. Renee is a frequent subject of the artist, as are other family members. “Raising Renee”, a feature-length documentary film produced in association with HBO by Academy Award-nominated and award-winning filmmakers Steven Ascher and Jeanne Jordan, tells the story of the impact of McIver’s promise to care for her sister when their mother dies. The film played in festivals around the country and was nominated for an Emmy Award for Outstanding Arts and Culture Programming. McIver’s work is in the collection of the North Carolina Museum of Art, the Weatherspoon Art Museum, the Baltimore Museum of Art, the NCCU Museum of Art , the Asheville Museum of Art, The Crocker Art Museum, the Nelson Fine Arts Center Art Museum at Arizona State University, the Nasher Museum of Art at Duke University, and the Mint Museum as well as significant corporate and private collections. McIver is currently the Ebenshade Professor of the Practice in Studio Arts At Duke University. She was the Suntrust Endowed Chair Professor of Art at North Carolina Central University, 2007-2014. Prior to this appointment, McIver taught at Arizona State University in Tempe, AZ. for twelve years, Duke University, North Carolina State University and North Carolina Central University. She has also held residencies at many of the nation’s leading artist communities, including YADDO, the Headland Center for the Arts, Djerassi, and Penland School of Arts and Crafts. She has served on the board at Penland, and currently serves on the board of directors at YADDO in Saratoga Springs, NY. McIver was named as one of the “Top Ten in Painting” in Art in America in 2011, and her work has been reviewed in Art News, The New York Times and a host of local newspapers. She has received numerous grants and awards including the Anonymous Was A Woman Foundation grant, a John Simon Guggenheim Fellowship, a Radcliffe Fellowship from Harvard University, a Marie Walsh Sharpe Foundation award, a distinguished Alumni Award from Pennsylvania State University, a Louis Comfort Tiffany Foundation Award and Creative Capital grant. She had a solo exhibition at the North Carolina Museum of Art in 2011, and at the Mint Museum in 2012. During the fall of 2014, McIver was Artist-in-Residence at the McColl Center for Art + Innovation in Charlotte, N.C.
McIver received a master of fine arts degree in painting from Pennsylvania State University, and an honorary doctorate from North Carolina Central University.